The Spritz tradition started in 1922 in Terre Haute, Indiana. Two brothers-in-law, J.B. Greenfield and Irvine S. Spritz created a jewelry store that would offer its customers full-service attention and the finest products money could buy, all at an affordable price. The great Spritz clock originally stood on the corner in front of the Spritz Building on Neil Street. Accurate for many decades then the mechanical movement was converted to electrical in the 1970’s and later to a high torque movement. The clock was moved in the early 1970’s, during the renovation of the Downtown mall, to the corner of Neil and Main Street – this placed it across from the new Spritz store at 215 North Neil Street and was visible to traffic on Neil and Church/Main Street. In 1997, Spritz donated the clock to the City of Champaign. Extensive rebuilding of movement and case makes the clock a fixture in the heart of Downtown Champaign. Grandparents and great-grandparents of current Spritz customers tell us of where they bought their engagement rings. Our first location in Champaign at 110 North Neil was directly across the street from the Champaign Police Department (now the City Building). The Lewis Department store was just west of Spritz. 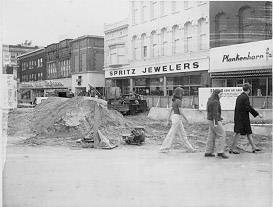 This location remained the Spritz Champaign Headquarters until 1973 (the new Downtown mall). Spritz then moved just down the street to the Kresges Building with China, Crystal Giftware, Electronics, and of course, the finest diamond and gold Jewelry in all of Central Illinois. Wooden sidewalks were back in fashion for the construction site of the new Downtown Champaign mall. The mess of construction lasted way too long, Neil Street was closed, the merchants assessed the cost and the customers searched for parking. The mall finally was voted down a few years later, and in 1986 the street was re-opened and business flourished. 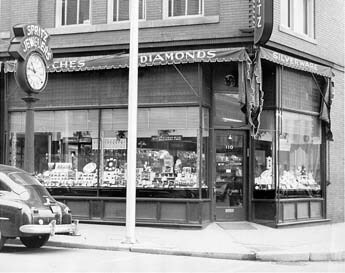 Now, three generations later, the descendents of the original family of Spritz Jewelers continue to provide customers the full-service and quality they deserve. Spritz is dedicated to selling the best diamonds, jewelry and giftware at very competitive prices. We have a commitment to you, our most important gems. Let us be your full service jeweler.